One summer morning I was hanging out with Jean-Bernard Larrieu at Clos Lapeyre tasting through a recent vintage. When we had wrapped things up, I asked him if he knew of any beer producers in the area, as I often like to finish off tastings with a beer. Jean-Bernard brought out a couple of bottles which had been given to him, one whose label was in Basque and the other with a large goat head on it. 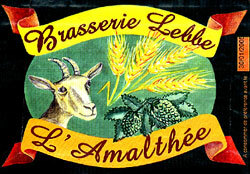 We tasted both and I particularly liked "the goat beer" called L'Amalthée (the malted). I noticed it was from the Haut-Pyrénées departément, which I remember thinking was too far of a drive to buy only beer. 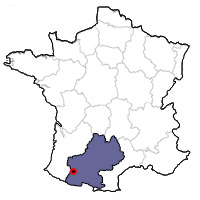 But Jean-Bernard informed me that the town was only ten kilometers south of Madiran, and upon hearing that, I decided to go that very afternoon. After all, it was a typical humid July in the Southwest, and a cold beer sounded much more appealing than an inky Southwestern French red at apéritif time. I decided it would be an excellent idea to go and buy only beer! It took me a while to find the property, as its small sign along the Route National was partially hidden by some undergrowth. I made my way up the long twisting drive to discover an elegant chateau next to some ramshackle buildings. 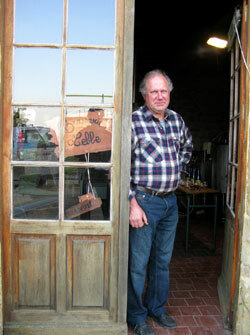 Its owner, Pierre Lebbe, was born in Belgium but as a child moved to Tarbes, a city not too far from Pau. He and his wife Annick, I learned, bought a property in the town of Villefranque, tucked into the small foothills which overlook southern Madiran. Their primary occupation is the production of goat cheese, and for this they have 120 goats who roam the open pastures surrounding the farm. They produce and mold the cheese, and then sell it to some large firms who finish, package and market the product. 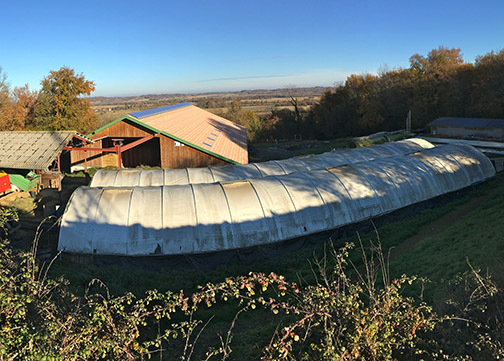 About ten years ago they made the decision to work organically, and now have a self-sustaining farm powered by natural goat compost and the wind. They feel that their entire family is more healthy because of it, and they rarely get colds during the winter months. Having Belgian roots and a love for beer, Pierre would understandably fiddle around now and then with a bit of home brew on the farm. Then a friend who had a small brasserie in the north of France decided to expand and buy larger equipment. He offered Pierre two small stainless steel vats, which now sit beside each other in one of his farm buildings. Tasting Notes: Big off-white head sits atop a hazy rich amber colored brew. Aromas and flavors suggest citrus, honey, herbs, hops, chocolate and nuts. Light and refreshing, and pleasantly malty. Pierre's dream of producing an organic beer made mostly with the products grown himself was about to become a reality. He tweaked the vats as well as the tubes running between them, adapting the controls to the size of his production. Several years of trials have finally allowed Lebbe the proper formula. He now makes about 600 bottles a month, filled by hand in 750 ml bottles. Barley, the main raw material in beer, is grown on the property. The barley is partly germinated and then dried which allows the starch to be diffused easily during the brewing process. The crushed malt is mixed with pure Pyrénée Mountain spring water in the first vat. In order to convert the grain starch into fermentable sugars, the mash is successively heated to different temperature levels. The mash is then filtered so as to separate the spent grains (the grain husks and the insoluble residues) from the liquid, and goes into the adjacent vat. The spent grains are stored and later used to feed the goats. This liquid, which will become beer, is now called wort. Afterwards the wort is boiled and organic hops are added. The wort passes to the other vat through a light filter and is cleared of its solid particles. Then it is cooled and goes back into the empty vat. Pierre adds an organic yeast he buys from Germany (which, along with the hops, are the only ingredients not coming from the farm) to the wort, where the fermentation begins and runs for five days. Once the fermentation is over, it passes into the empty vat, where it is conditioned by remaining at a low temperature for several days. A touch of sugar and yeast is added at bottling time and refermentation takes place in the bottle. The alcohol level finishes at 6%, and the conditioned beer evolves and develops over the course of two years following its bottling. A light deposit forms at the bottom of the bottle, insuring the customer of the integrity of this natural farmhouse beer.